Energy storage can help the grid in so many ways – it allows us to save electricity for a more appropriate time or can be used in multiple applications to assist in balancing and maintaining the grid. While energy storage can be complicated, this paper is meant to break it into digestible pieces. The electricity grid is the centerpiece of the puzzle. The grid can be broken into three parts: generation, transmission, and distribution. In order to meet demand, utilities must be prepared to distribute electricity instantaneously, through a constant balance of supply and demand. The grid receives its electric current from electricity generation and in some cases from stored electricity through energy storage. In the simplest terms, energy generation controls time, from when and how we use it. Energy storage applications can fall into all portions of the grid and can be helpful as a way to improve the overall energy grid. Generation is where electricity is produced and energy storage applications can assist in various ways to ensure adequate electricity supply is available. Energy storage can supply energy when demand is larger than current supply, if there are any disruptions in traditional forms of generation, and at times when renewable resources are not generating electricity. One prime example of assisting in meeting demand is the use of storage during “peak,” where the demand reaches its highest point during the day. Rather than turn on a natural gas power plant to meet peak demand, storage applications can be used instead. Using storage in some cases can potentially reduce the carbon consumed or save in cost in some locations. In most cases, energy generation occurs far from population centers, which requires the generation to be transmitted across long distances. Transmission lines then carry the generated electricity to be distributed. Energy storage applications can help in the meantime to help relieve congestion, potentially deferring transmission upgrades, and can provide grid stabilization and maintain continuous power supply. Distribution to customers occurs after being converted to a lower voltage from the transmission lines. Energy storage applications can also apply in distribution to provide backup power in case of outages, for microgrids, and in reducing demand charges for customers by providing additional electricity during peak demand. Energy storage as a technology has been around for almost a hundred years in the United States and Europe through pumped hydroelectric storage.2 Modern energy storage as we know it began in 1978 at Sandia National Lab through a program called “Batteries for Specific Solar Applications,” which focused on developing batteries along with other renewables.3 This program began shortly after the formal creation of the Department of Energy and was expanded quickly with a focus on batteries for electric vehicles. Over time, this program, now known as the Energy Storage Systems Program (ESSP) grew to include additional energy storage technologies such as flywheels and compressed air energy storage. 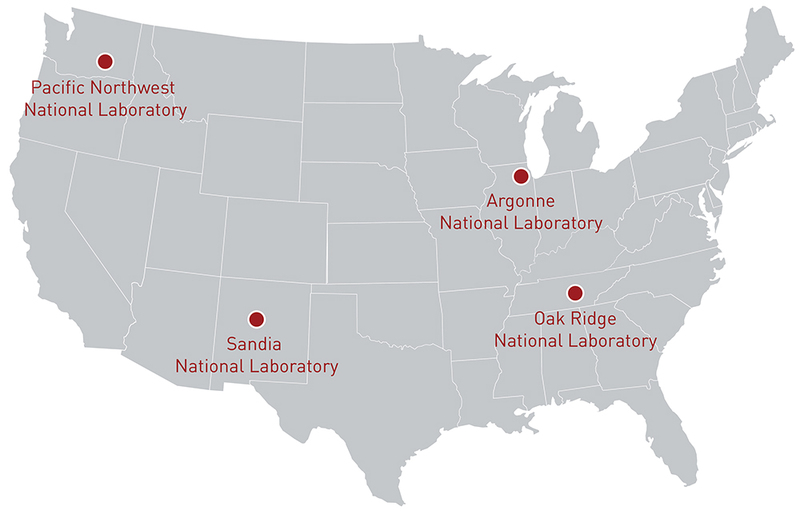 While the ESSP initially began at Sandia National Lab, cross-collaborative research from materials science to demonstrations of energy storage technologies continues at Argonne National Lab, Oak Ridge National Lab, and Pacific Northwest National Lab. Research from these labs have continued to develop in the private sector, alongside separate private research and will continue to evolve over time. Energy storage as a whole includes multiple technologies within chemical, mechanical, thermal, and kinetic energies. Chemical energy includes current batteries through chemical reactions within various battery types. Mechanical energy includes pumped hydro and compressed air energy storage. Thermal energy includes solar thermal power plants as well as heating and cooling objects by creating large temperature differences to store excess energy for later use. Flywheels are an example of kinetic energy. Lithium-ion batteries range in chemistry composition, but all lithium-ion batteries transfer lithium-ions between their cathode and anode, where the cathode is usually a metal oxide and the most common anode is made up of graphite. 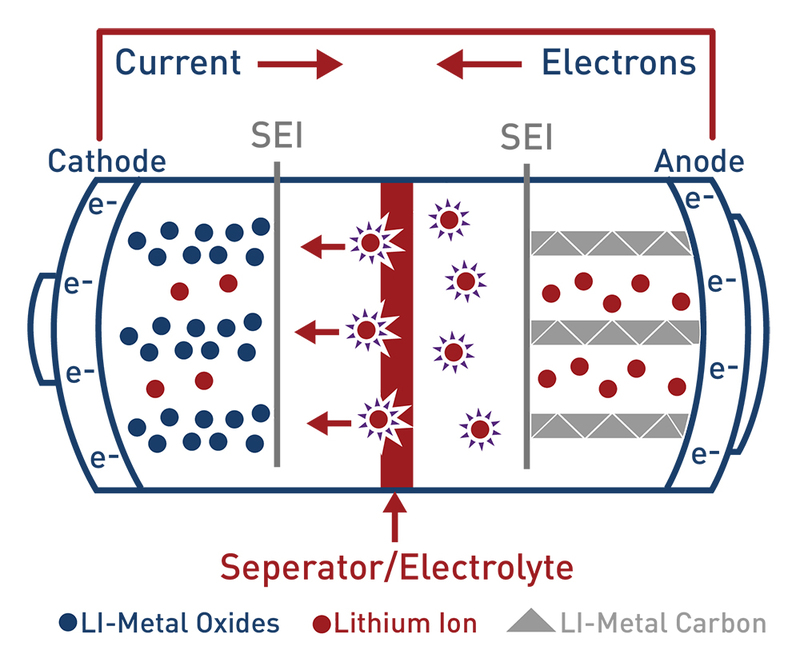 Lithium-ion batteries can have a liquid electrolyte or a solid state electrolyte. Lithium-ion batteries have a lithium polymer where the electrodes are bonded together by a porous polymer matrix. This means the battery itself has a specific chemistry that varies, changing the battery’s capabilities. Depending on chemistry differences, there are benefits and concerns with each type as well as some being more successful than others. The benefits of lithium ion include: high energy density, less expensive, have long lifetime cycles, are rechargeable, have low maintenance, and have high rate discharge capability. Lithium-ion batteries have been successfully deployed in electric vehicles, mobile phones, and laptops. There is growth in research, design, and manufacturing for large scale projects for use in grid scale storage applications. Solid State Batteries have solid electrodes, cathodes, and anodes regardless of their chemistry. Basic chemistry varies in the types of solid state batteries, with three being very common: lithium-ion, nickel-cadmium, and sodium-sulfur. In addition to solid state lithium-ion batteries, other solid state batteries include those with the chemical compositions of nickel-cadmium and sodium-sulfur. Nickel-cadmium batteries are considered a traditional battery, meaning they remain a valid option to provide a long and reliable life cycle even when energy density and cost are not as great as lithium-ion. Nickel-cadmium batteries have been used successfully in grid scale storage as well for short duration use, and in island grid systems. Sodium-sulfur batteries are another stationary application with high efficiency. Japan has demonstrated this technology at multiple locations for six hour duration for peak shaving purposes.4 While both of these battery chemistries have been tested and deployed they are still not nearly as common as lithium-ion batteries, which currently dominate the market. Flow batteries consist of a reversible chemical reaction, which occurs in multiple tanks. The electrodes are dissolved in electrolyte solutions stored in tanks – an anolyte tank containing an anode and a catholyte tank containing a cathode. These are pumped into cell stacks where the reversible reactions occur when the battery charges and discharges.5 There are two main flow battery systems: True flow or pure flow where all materials are stored separately from the cell and hybrid flow batteries where one or more of the active materials are stored within the cell. 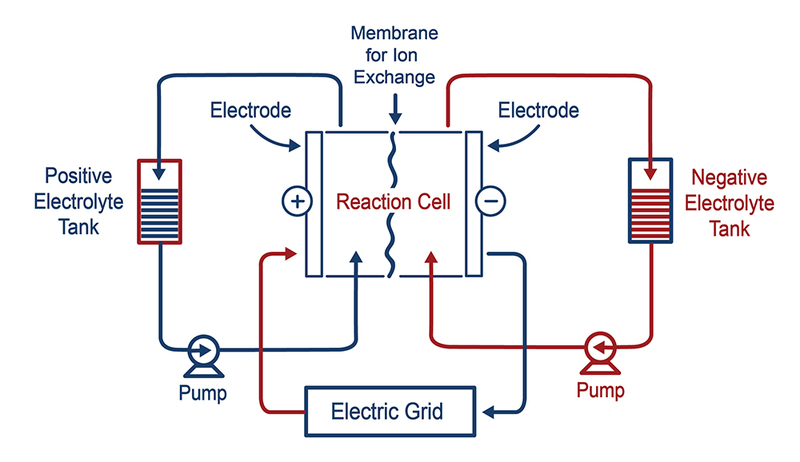 Flow batteries can also vary depending on the materials used for the chemical reaction in the electrolyte tanks. Flow batteries store energy in the liquid electrolyte tanks while traditional batteries store energy in their electrode materials. Flow batteries have high energy efficiency, long life cycles, can be long duration with fast response times as well as being capable of deep discharges. However, electrolyte stability is always a concern along with potential corrosion of materials. 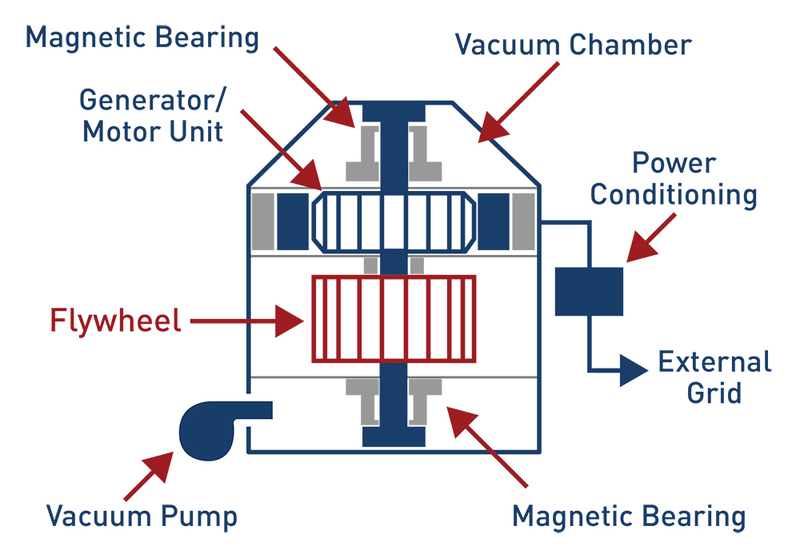 Flywheels are a very short duration form of energy storage that store energy by accelerating and braking a rotating mass – it’s connected to a reversible electrical machine that acts as a motor during charge that draws electricity from the grid to spin the flywheel up to a selected operating speed. The amount of energy that can be stored in a flywheel depends primarily on the momentum of inertia of the rotor (weight) and the speed at which it rotates. While flywheels have fast discharging capabilities, long life cycles, and no capacity degradation over time, they have low energy density, and can self-discharge. Overall flywheels would be best for frequency stabilization in the power grid rather than medium or long duration storage. Compressed Air Energy Storage or CAES stores energy in the form of compressed air in an underground reservoir for use at a later time. CAES is very similar to pumped hydro power in storage concepts, however, usage of the stored air is different than simply releasing water through a turbine. CAES systems release the pressurized air by heating it in order to expand it, which then turns a turbine, generating electricity.6 This is done through two systems – diabatic or adiabatic. 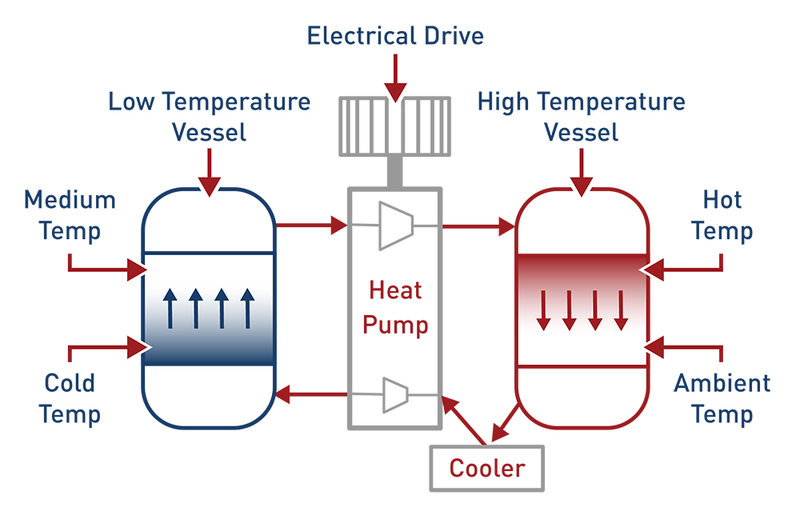 Diabatic systems are really hybrid systems, where natural gas is used to heat the compressed air, resulting in expansion and a way for the turbine to generate electricity. 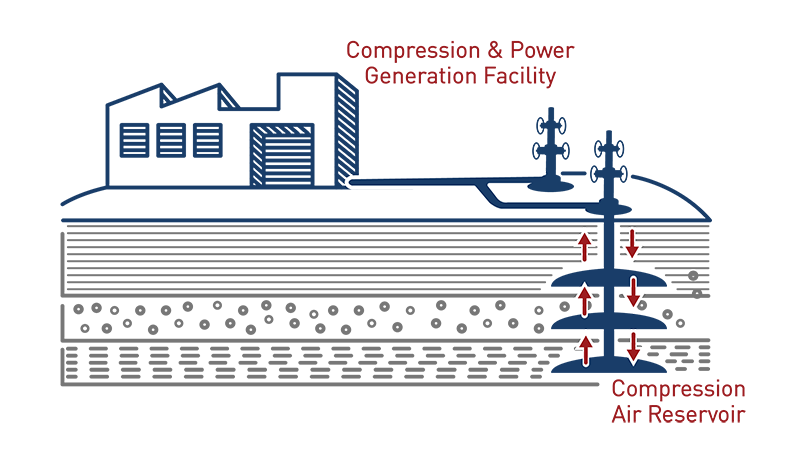 Adiabatic systems do not use natural gas to reheat the air in the expansion process, rather the excess heat is stored above ground for future use when the air is meant to be expanded. Currently, only two CAES diabatic grid scale systems exist, one in Alabama and one in Germany. CAES have several benefits, but ideally they work best in balancing energy, for greater integration of renewable energy, ancillary services for the grid such as regulation, black-start, and grid stabilization. 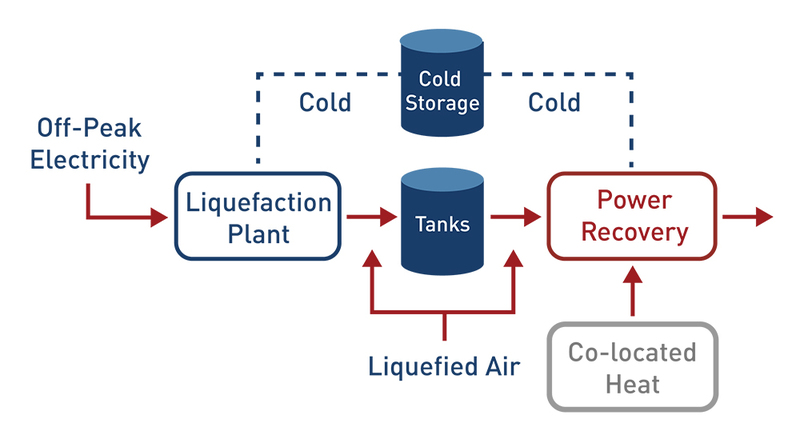 Thermal energy storage takes excess energy and stores it in various materials, including rocks, cement, storage tanks, hydrogen, and in liquid air. This is really a transfer of energy into a material that is capable of storing the energy for a longer time frame instead of wasting the excess or less expensive energy. A great example of this is solar thermal water heating. Traditional Pumped Heat Electrical Storage compresses and expands gas through tanks filled with crushed rocks. This is usually a closed circuit where the gas is connected between a compressor and expander heating and cooling the crushed rocks as needed to store or use energy. 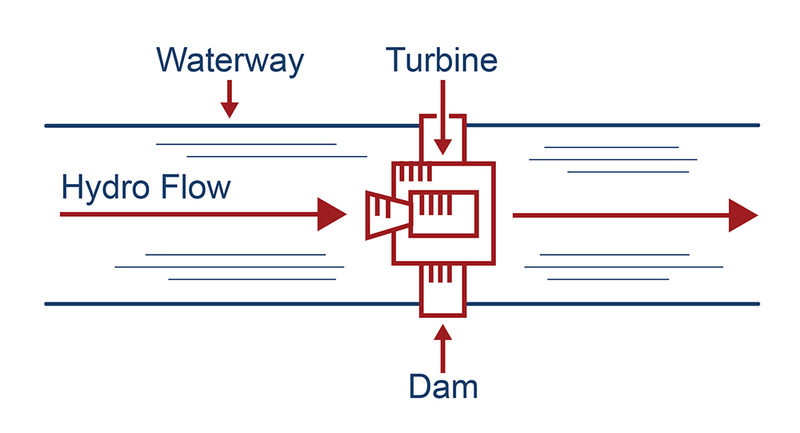 Pumped Hydropower uses gravity to turn a turbine. While this technology has been successful since the 1920s, it has been modified for additional uses such as underground pumped hydro, reservoir pumped hydro, and variable speed pumped hydro.10 In many cases, pumped hydropower is used as a form of baseload electricity generation because it is reliable and inexpensive. However, over time it has become much more complex, and can be used in various ways to help improve grid stability and even act like a “peaker plant,” used at times when peak energy demand is at its highest to help reduce consumption of natural gas in natural gas peaker plants through variable speed pump-turbines. Traditional pumped hydropower stores energy in an upper reservoir or one higher in elevation than a lower reservoir. When wanting to store energy, water is pumped to the higher reservoir for later use. To “discharge,” or use the stored energy, it is released to the lower reservoir to generate electricity by turning a turbine. Underground pumped hydropower uses two reservoirs as well, they are both underground. These can be in man made storage reservoirs, mines, or caverns as well. In this system, energy is pumped from the lower reservoir to the higher reservoir as it “charges” the system, and to generate electricity, the water is released from the higher reservoir to the lower reservoir. What role does Energy Storage play in the future? The future of energy storage is very promising and will continue to evolve as new technologies are developed. As costs decrease and renewables continue to grow, energy storage may have a larger market share. Currently there are no federal energy storage policies or mandates, however, there are a few states with energy storage mandates or policies. State policies, wholesale market rules, retail rates, and technological innovations are expected to impact the future of energy storage as a whole. The Federal Energy Regulatory Commission (FERC) released Order 841’s “Final Rule” for storage participation to remove barriers for energy storage in capacity, energy generation, and ancillary services markets in February 2018. The purpose of the order is to increase competition within the markets while supporting resiliency of the power system.11 Current markets are very difficult for energy storage to fully participate due to regulations in various markets, limiting how and if storage could participate. Generally, storage was not being utilized and could not compete with less expensive resources as a stand alone option. With this Order, each Regional Transmission Organization (RTO) is required to create a participation model that opens up market participation for energy storage resources. As the RTOs create rules based on the requirements given by FERC, it will directly impact the value of energy storage in each market. Due to FERC Order 841, state mandates or proceedings, energy storage as a whole is difficult to predict, however, significant growth is expected in the market due to benefits and the evolution of electricity generation. Recent RTO filings will also impact how the storage space as a whole continues to move forward. This is due to each RTO’s unique plan to incorporate energy storage into the future. As things progress, each region will continue to develop uniquely based on how storage is viewed and how it is integrated will have significant impacts on storage developments and electricity markets as a whole. While this will be a learning curve for storage resources in the grid as a whole, each plan will allow the markets to be more competitive and adaptive to storage needs over time. As technology continues to improve and costs decline, there are several promising energy storage technologies that may become viable options in the next few years. Most of these technologies are simply adaptations of traditional or well-known energy storage technologies, but have been changed to reduce cost, reduce use of resources, or to increase energy efficiency for example. Several organizations have spurred out of the Department of Energy, universities, and think tanks all with a variety of funding from government grants or loans to foundation investments. Some interesting and promising technologies include storing energy in cement blocks as a way to mimic pumped hydro, an adapted version of subsurface pumped hydro, and liquifying air in a similar manner to compressed air energy storage.